Marlin Dumplings in a Spicy Broth | Gourmet from the galley! 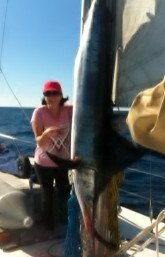 At the moment we are still working our way through the marlin we caught out from South West Rocks, NSW. I’m having a lot of fun thinking up new ways to serve Marlin, and these marlin dumplings are one of my favourite creations so far and very easy to make. In a food processor I blended marlin with some fresh ginger, fish sauce and spring onions, then I mixed in some chives. I made the dumplings using wanton wrappers. For the broth I use chicken stock, five spice, chilli, and some slices of fresh ginger. I brought the broth to the boil then reduced the heat and simmered for a few minutes. I simmered the dumplings in the broth for 3-4 minutes, then they were ready to serve! Like this simple meal? Please pin and share with family and friends… thank you!